Tabletex. Yep, that's what we're calling this year's Computex since you truly cannot go a few steps on the show floor without stumbling upon a new tablet of some kind. If you've been reading our coverage for the past few days, you know that Intel and Microsoft didn't show up in Taipei empty handed -- both of their booths are incredibly well stocked with new slates. Most of them, which range from early prototypes to quite functional, have 10-inch displays, run Windows 7 Premium and pack Intel Atom Z or N series processors -- in essence they're very much netbooks sans the keyboard panel. There are way too many of them to count, but don't you worry, we've rounded up some details and shots of the most appealing ones on display here at the show. 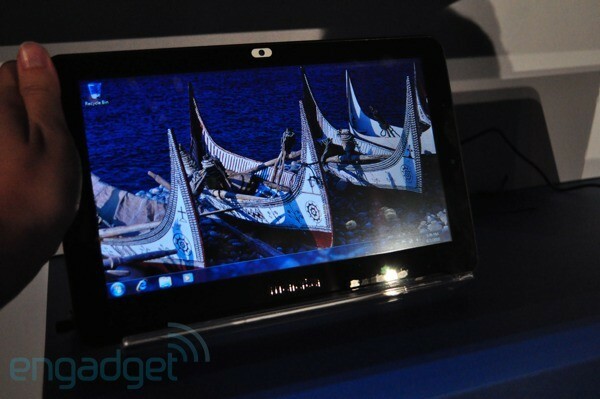 Follow on after the break for a look at some of the newest Wintel tablets. And check the gallery below for a variety of hands-on shots. We have to say the 10-inch Viliv X10 is one of the more attractive and solidly built Wintel tablets on display at the show. It's got brushed aluminum edges and a red carabiner slot of sorts on its bottom right bezel. The model on display wasn't final, but there were placeholders for a USB port, microphone jack and MicroSD slot. 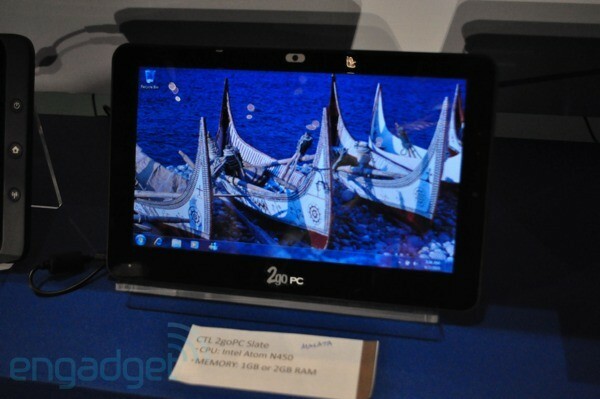 It will be available with an Intel Atom Z520 or Z530 processor, 1GB of RAM, and a 32 or 64GB SSD. It has a 1.3-megapixel webcam. 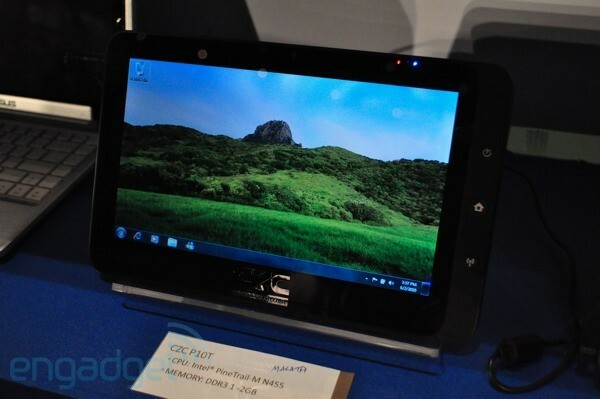 Compal's 10-inch NEZ00 looks like a fairly slim Windows 7 tablet. It has a super glossy screen, like most pictured here. (Seriously, what's wrong with matte displays people?) It boasts an Intel Atom N450 processor and 1GB of RAM. Note: we are noticing most have 2GB of RAM to run Windows 7 Home Premium faster. We had heard about CTL's 2goPC Slate a few months back and its now found a temporary home at the Microsoft booth here in Taipei. 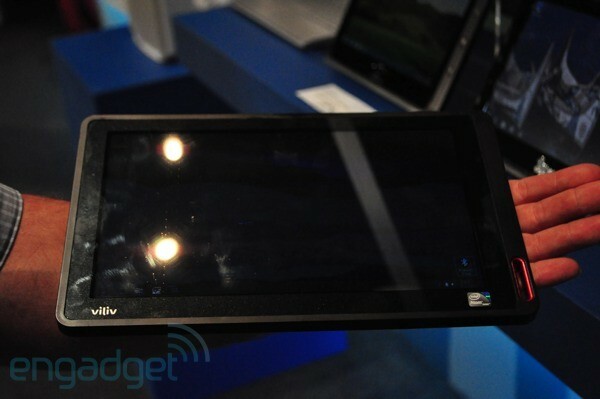 In all honesty, the 2goPC seems thicker than most other Windows 7 tablets around, but it has a nice capactive screen. Other than that it has an Intel Atom N450 processor, two USB ports and mini-VGA jack. It will also run a Blue Dolphin skin on top of Windows. We can't tell you much about this one other than its got quite a tacky silverish CZC logo smack on its bottom bezel. Unlike most of these it has some physical buttons on its left edge. According to the placard, it's powered by an Intel Atom N455 processor and 1GB of RAM. 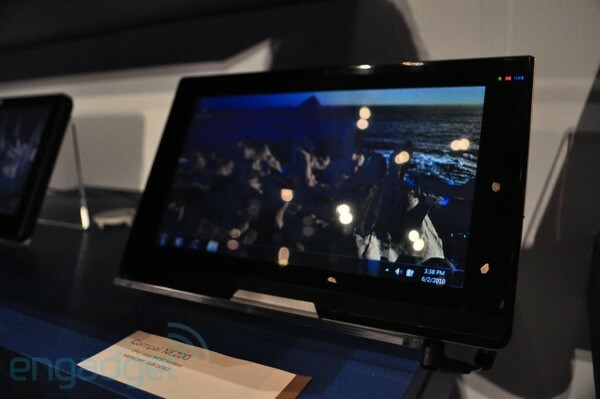 This happens to be one of our favorite looking tablets at the show. It's quite thin and comes in a variety of colors, including red, orange and platinum. We're not sure why the speaker grill is on the bottom screen bezel, but it does give it a different look. Internally, this one packs an N455 Atom, Win 7 Home Premium, and a Broadcom Crystal HD decoder. It will have a 2700mAH battery. Last but not least is the Malata PC-A10001, which we hope gets a more digestable name by the time it hits the market. 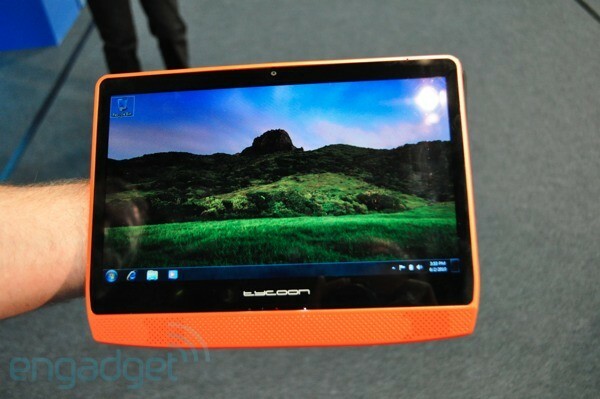 Like the others it has an Intel Atom N450 processor and Windows 7 Home Premium. According to the specs placard Malata will be cramming in a full hard drive since there are 160GB, 250GB, 320GB options listed. And as you can see in the picture it has a 1.3-megapixel webcam. Keep in mind that many of these are just ODM designs, meaning they will eventually be brought to market under a different name so we don't have details on pricing or availability. If that's not enough Windows 7 slates for you, you can always check out our dedicated hands-on posts with the LG UX10 and ExoPC.